Dreamfactory has long touted our ability to securely generate REST APIs from a slew of different sources like SQL,NoSQL,SOAP, Files, AD/LDAP, SNS, SSO but Dreamfactory also allows you to connect existing REST services. In this short tutorial I’ll show you how to configure an HTTP service in DreamFactory using Open Data from data.gov, test it out and even infuse a little Swagger for documentation! Open Data, particularly Open Government Data has several benefits. The first and most widely discussed benefit is transparency which can lead to civic engagement and foster innovation. However there are often less recognized economic benefits to using open data. For the purpose of this tutorial we will be using the U.S. Energy Information Administration API which provides information on the usage, imports and exports of renewable and nonrenewable energy such as coal, nuclear, electricity and petroleum. You will need to register for an API Key to follow along with this tutorial so if you haven’t done so yet, register and keep your API Key in a safe place for later use. Verb – The HTTP verb matching the API call being used e.g. GET,POST,PATCH,PUT, DELETE. Server-Name – The name or IP given to the installed web server that is running the DreamFactory instance. Api-Version – This is the version number of the REST API, currently “2”. Performing a GET here returns an array of available services when permissions allow. 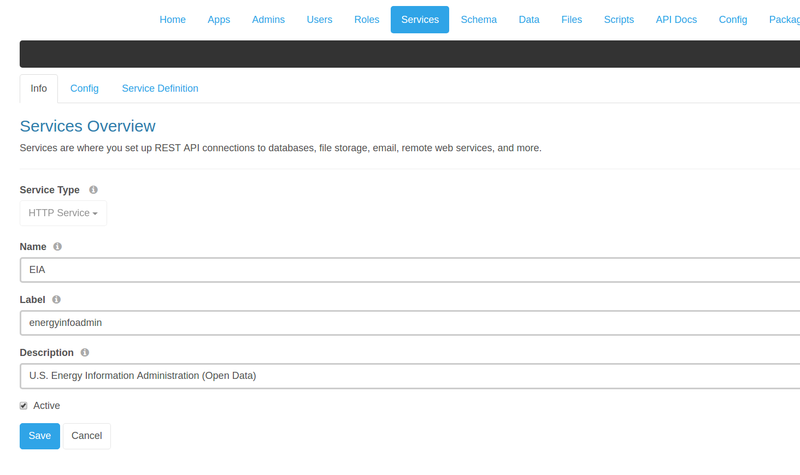 Service-Name – The API name of the service you want to access. Performing a GET here on most of the native services will return an array of available resources. Resource-Path – The optional resource path of the service. This path may include multiple sections divided by ‘/’ as such to define the resource. Different resource paths or resource paths that have multiple sections when called upon with GET will often provide different or more granular representations of the requested data. The above information is the foundation for understanding DreamFactory services and API calls. This information will take you far my friend, know it well. Most API publishers will provide some accompanying documentation to help you get started with their API. Fortunately the folks over at the U.S. General Services Administration, Technology Transformation Service who developed data.gov did exactly this making getting started with the API that much easier! Looking over the U.S. Energy Information Administration API documentation I chose four endpoints which were Category, Updates, Series and Series Categories to be the focus of this tutorial. Let’s get started with a basic HTTP service configuration. The minimum requirements to get started using the HTTP service are a service name and base URL. Let’s go ahead and create our service. 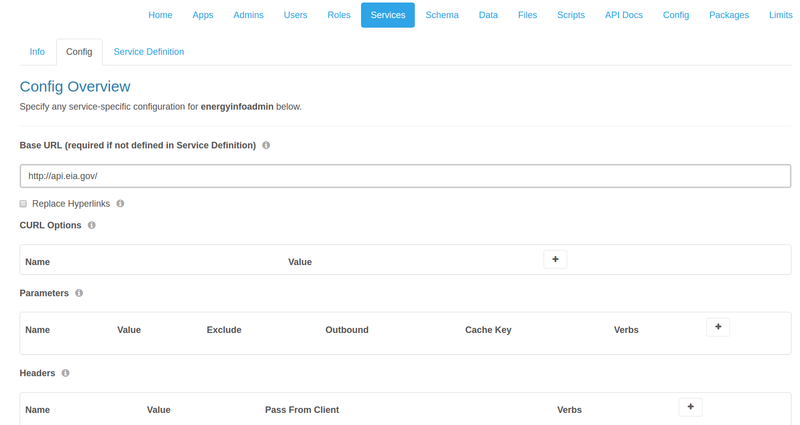 In my example I’ve named my service ‘EIA’ , labeled it, marked it active and provided a brief description to make the service identifiable to other DreamFactory Users and Admins. If the call on the ‘category’ resource was successful you should be returned a tidy little JSON response containing a list of category ids and names representative of the subtopic, these will be listed under ‘childcategories’ . Category ids can be used as query parameters in subsequent API calls. Let’s try to query the API using the category id 1292190 which is ‘Crude Oil Imports’. Before we do this let’s try to make our lives a little easier by not having to tote that API Key around with us every time we want to make an API call. Parameter names and values like our API Key can be hard coded into every API call you make through DreamFactory to the API, this also applies to headers and cURL options. This can be achieved via the service config tab by clicking on ‘Manage’ and clicking on the service you will be able to edit the HTTP service. Once you’re back in to the service configuration click the ‘Config’ tab and under parameters click the button that has the ‘+’ symbol to add the API Key as a parameter, you can add other additional parameters, headers and cURL options by clicking the ‘+’ button. In the param-name field put ‘api_key’ and in the param-value field put your API key the U.S. Energy Information Administration generously provided you, check the ‘Outbound’ box to pass the API Key on all API calls and select GET verb only as the API is read-only. Save the changes. The API Key isn’t required as it is in the service configuration now. Let’s call the API endpoint from ‘Test REST’, each call will return a set of ‘childcategories’ which describe different pieces of data that can be subsequently queried. This call returned Crude Oil Imports ‘By Origin’. I chose category id 1292192 for the next API call which references the origin United Arab Emirates. This API call returns additional options for Crude Oil Imports such as By State, By Refinery, By Port and By PADD. For the subsequent API call I will query ‘By State’ which is category id 1292271. Adding some Swagger to the service will make the HTTP service easier to comprehend for people who might be interested in using the API, this could be a developer, researcher, data scientist or anyone that has an interest in the data coming from the API. Also, what better way to show off what we’ve learned today than infusing some Swagger? DreamFactory supports Swagger definitions written in both JSON and YAML formats. Looking over the specification you’ll quickly notice some recurring themes and similarities with regards to how the definitions are written and the layout of API calls we discussed previously. Let’s add some Swagger now, the Swagger definition below written in JSON covers a few of the endpoints we discussed throughout this blog in addition to some others we didn’t. The definition isn’t comprehensive but will serve as a good starting point for documenting the API in further detail. Copy the below JSON in to your favorite text editor and save with a name you’ll remember using the .json file extension, I saved mine as ‘eia.json’ for reference. Once this is saved navigate to the ‘Services’ tab in the DreamFactory UI, click ‘manage’ and then click on the EIA service to edit. Navigate to the ‘Service Definition’ tab and beneath ’Select Format’ choose ‘JSON’ . Next, click ‘Select Desktop File’ and navigate to the JSON file we saved containing our Swagger definition. Once the definition is visibly in the Editor scroll through it to ensure there are no syntactic errors (the editor will highlight any errors with a red ‘x’). If everything looks good, click save! You may have noticed that there is an option in the Swagger definition to add the API key as a parameter, since the API key is in the service configuration it will be passed on every outbound API call. If you want to require users to acquire their own API key simply remove the parameter from the service config and edit the Swagger definition changing the ‘required’ option from ‘false’ to ‘true’ to enforce this requirement. Now that you’ve got some of the basics of how REST APIs work in DreamFactory I would encourage you to experiment with the HTTP services in DreamFactory to become acquainted. Once you’re feeling confident try your hand at writing your very own Swagger definitions using Open Data APIs and share them with the DreamFactory Community! You’ll receive kudos from the Community Managers and recognition from your peers as an upstanding citizen of the DreamFactory Community! I also heard somewhere that frequent contributors are eligible to win DreamFactory swag, so get involved today! If you’re just getting started you can sign up for a free thirty day trial of DreamFactory and get going with Open Data APIs today! Until next time, cheers and happy coding! Martineau, Pamela. “Open Data Evolution: From Increasing Transparency to Engaging Citizens.”Government Technology: State & Local Government News Articles. GovTech, 10 Mar. 2015. Web. 09 May 2017. <http://www.govtech.com/data/Open-Data-Evolution-From-Increasing-Transparency-to-Engaging-Citizens.html>. Newcombe, Tod. “How Government Can Unlock Economic Benefits from Open Data.”Government Technology: State & Local Government News Articles. GovTech, 16 Dec. 2014. Web. 09 May 2017. <http://www.govtech.com/data/How-Government-Can-Unlock-Economic-Benefits-from-Open-Data-Part-I.html>. ”U.S. Energy Information Administration – EIA – Independent Statistics and Analysis.” U.S. Energy Information Administration (EIA). N.p., n.d. Web. 08 May 2017. 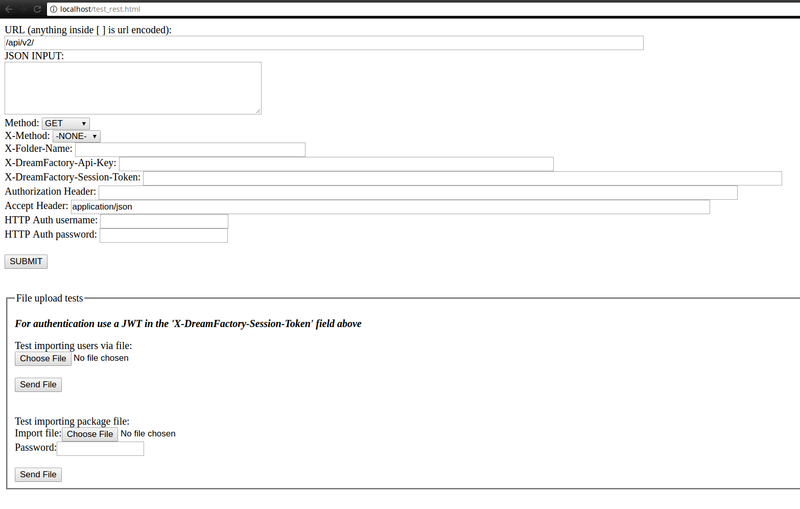 HTML URL Encoding Reference. N.p., n.d. Web. 08 May 2017. <https://www.w3schools.com/tags/ref_urlencode.asp>. ”Technology Transformation Service.” GSA Home. N.p., 31 Oct. 2016. Web. 08 May 2017. <https://www.gsa.gov/portal/category/25729>. ”Petroleum Administration for Defense Districts.” Wikipedia. Wikimedia Foundation, 09 Apr. 2017. Web. 08 May 2017. <https://en.wikipedia.org/wiki/Petroleum_Administration_for_Defense_Districts>. ”Specification.” Swagger. Swagger, n.d. Web. 09 May 2017. <http://swagger.io/specification/>.